The Maine Forest Service and multiple municipal fire departments fought a massive, fast-moving woods fire off College Street in Lewiston on Tuesday. 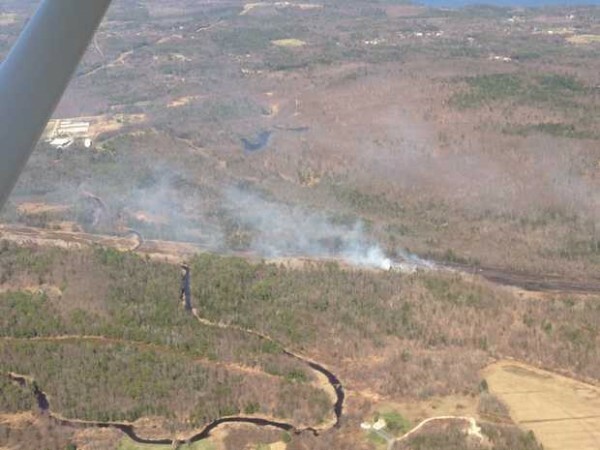 LEWISTON, Maine — A Maine Forest Service helicopter made “half a dozen water drops” onto a fire burning in a wooded area off College Road, but fire officials expect crews will be at the scene for hours fighting the two-alarm blaze. The fire is about a mile into the woods along power lines, both factors which make the blaze particularly difficult to battle, Kent Nelson, fire prevention specialist at the Maine Forest Service, said at 2:30 p.m.
Mutual aid from Auburn, Greene, Livermore, Turner, Paris, Hebron, Durham and Sabattus has been called, including forestry and off-road vehicles, Auburn Fire Department Battalion Chief Scott Hunter said at 2:45 p.m.
Fire danger on Tuesday was at Class 3, or high, Nelson said.